Bennett and Lapid deny media reports that they plan to demand the Foreign and Finance Ministries or stay away from the coalition. Another day, another politically related spin: Channel 2 News reported on Wednesday night that the pact between the Yesh Atid and Bayit Yehudi parties had gotten stronger and that Kadima had joined the pact as well. 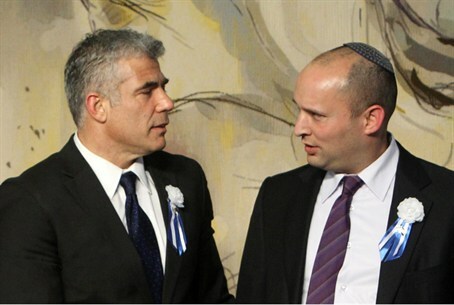 The report claimed that the leaders of the three parties - Yair Lapid, Naftali Bennett and Shaul Mofaz - would each demand that Prime Minister Binyamin Netanyahu appoint Lapid to the position of Foreign Minister and Bennett to the position of Finance Minister or else they would not join the coalition. “We are working hard to help the Prime Minister establish a new government that can begin to work for the people of Israel,” he added. The coalition negotiations have brought with them many unverified reports and spins over the past few weeks. On Tuesday, it was reported that Lapid had been offered the Finance Ministry, but his party has not yet responded to the offer. Sources in the Bayit Yehudi denied reports that party head Bennett had accepted an offer from Netanyahu to serve as Finance Minister. The two did not discuss the matter, they said. On Wednesday it was reported that coalition talks between the Likud Beytenu, Yesh Atid and Bayit Yehudi parties had taken a step forward, but the process is being complicated by Lapid’s insistence that the government be limited to 18 ministries. Lapid pledged during the elections campaign to avoid the trend of spending public money on ministries created solely to appease coalition partners. In addition, Bennett has demanded that Netanyahu not give parties that join the coalition the chance to divert public money to their own causes.